Hotel Escape is an adventure and puzzle map which tests your skills at solving puzzles and abilities to escape. It takes inspiration from popular escape rooms and brings similar challenges to Minecraft. There are 10 different rooms which you’ll need to escape from and you can expect between 20 minutes to 2+ hours worth of gameplay. It’s all dependent on your own skills. The map took just over one week to build and it uses a complex system of redstone and command blocks to give the player a very fun and unique gameplay. You’ve been imprisoned inside one of the largest prisons in Minecraft. But you are not alone. Hundreds of villagers are also held captive here. A voice has recently started speaking to you. Either you’ve gone completely nuts or you might finally be able to escape the prison. But you need to be careful since zombie pigmen are guarding the facility both day and night. Evasion is an adventure puzzle map which takes place in a maximum security prison. You were sent there after you got a little overconfident and decided to rob the National Bank of Minecraft. The objective at hand is to solve puzzles and make trades with other inmates to one day be able to escape the prison and reunite with your old gang on the outside. It’s definitely a fun experience and it’s supposedly based off a popular game called The Escapist. You were one part of one of the most powerful gangs in Minecraft. No one ever dared to mess with you, not even the cops! One day you decided to go alone and rob the National Bank of Minecraft. You fought for a long time but finally you were surrounded and the cops took you in custody. Soon after you were sentenced and sent away to a Maximum Security Prison. But you don’t plan on staying there any long time. You’ve decided to work alongside the other prison mates to find ways to trade, fight and solve puzzles and ultimately escape this prison. Will you have what it takes to do this? You can talk with other prisoners by stepping on the pressure plates. Often times they will have small missions which you can complete in exchange for something you need. This is the fifth map in the BrainGames puzzle map series. It features six different levels of changing difficulty. In each level you will be presented with a problem which your task will be to solve. It sure takes quite a bit of brainpower to complete but that’s pretty much the whole point of a puzzle map. If you like puzzles and problem solving make sure to give it a try! The Redstone Academy should be the first stop for anyone who find themselves struggling with redstone or just want to learn more about it. It’s primarily used for building different types of machines and structures which main goal is to achieve things more efficiently. People have built everything from complex computer systems to more basic setups such as automatic farms and it’s truly just your imagination which sets the limits. This map will teach you the basics of redstone and at the end test your skills. As soon as you’ve spawned it’s important that you take some time to read the signs. There are four different stages of The Redstone Academy. First off you will learn some about redstone and the functionalities. And then later on you will be going through a few puzzles which require redstone to be solved. Getting trolled is usually not something positive, but don’t let that be something discouraging in this case. Here’s a really fun (and sometimes extremely frustrating) puzzle map. Let’s just say that whenever that you think you are right you are most likely wrong. It’s really easy to get fooled in this map and that’s a part of what makes it fun. Prepare yourself to get trolled! Did you enjoy this map? Make sure to check out the previous map! Brain Games is a map consisting of multiple different puzzles which need to be solved. In each level you will be presented with a problem and since there are no instructions it definitely makes the levels difficult to complete. The challenges are all different and they range from redstone problems to unusual problems involving chickens. 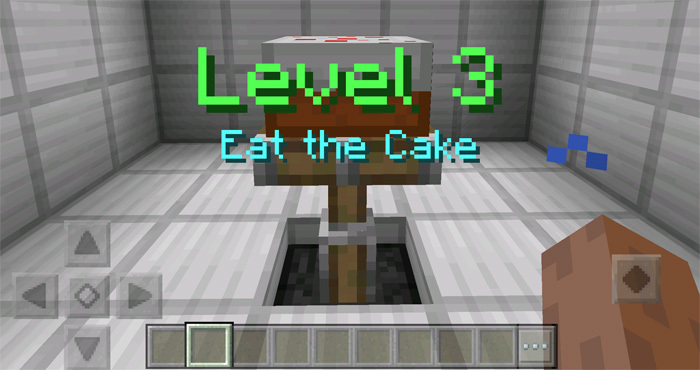 The Quests is one of the first puzzle maps for Minecraft PE which uses command blocks. It really opens up an entire new realm of possibilities since map makers will no longer be limited by just some redstone dust. It’s a really cool map which includes everything from cake eating to going on a space mission to Mars. Important: This map requires alpha version 1.0.5 for Minecraft Pocket Edition. Android users can sign up for the alpha here! BrainGames 4 is a puzzle map with six levels. It’s a bit smaller than the previous maps but it’s nonetheless some complicated puzzels which require a calm and focused mind. The concept is simple. In each room you will be presented with a unique problem which requires some type of solution. Usually it involves something which triggers a redstone signal and opens the door to the next level. Heist Master is a short puzzle map in which your character is a professional hacker and have to do some illegal hacking in order to provide for his family. Work your way through 6 different puzzles and try to get to the end where (hopefully) lots of money awaits. Storyline: You are a professional hacker and just a few days ago you was fired from your work at a bank. You are in a desperate situation with no money to buy food for your family. The only way out is to hack the bank and try to steal their money. The puzzles are of varied difficulty but for the most part they are quite simple to complete.